The nights have been warmer than I expected based on weather reports - cool enough for easy sleep but not so cold as to wake up shivering. Still, my hips ached after a second night with no mattress, sleeping on the hard wooden tent platform. We were up and ready to go early as we wanted to make a stop at Delta Camp and the park store and museum there. Weather predictions were for rain and wind again, and the day did start out overcast. But any serious wind never developed and by mid afternoon the sky cleared, the sun appeared and we experienced one of the most pleasant days of the trip in camp. We had stayed at Delta Camp on our last trip (click here to read the Delta Camp 2009 report). We hated the landing there. Unlike every other camp, this one had hundreds of feet of ankle deep mud to carry gear and boats across to get above the high tide line. And a hiking trail from the adjacent park area passed right through our campsite, compromising our privacy. The landing for the day park is much different, with a shallow hard sand bottom. 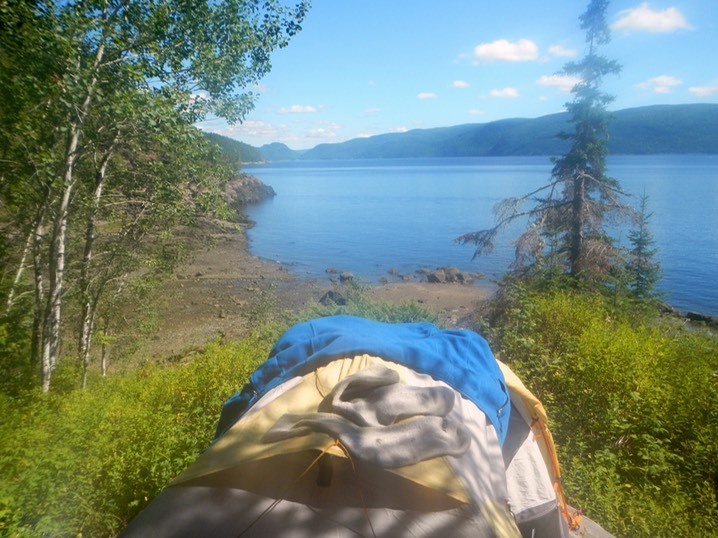 The trip into Delta's bay was about 3.5 miles, adding about 7 miles to the day's short trip of 8 miles to our camp at Anse du Portage. I offered to stay with the boats while the others went ashore to explore. As the tide was going out, my job was to keep pushing the boats out into the receding shallow water so that they did not become stranded high and dry. No one wanted to carry fully loaded boats into deeper water. After a while, Bruce returned with an ice-cream cone for me and offered to stay with the boats so I could take a break. I walked up to the store and museum and explored the museum. The small museum makes an excellent presentation of information on the history, topography and hydrology of the fjord, understandable even if the text of every display is in French. We spent about 45 minutes at Delta before heading out for Anse du Portage. It was a nice day, so we poked along, exploring and just enjoying being out on the water. From the Delta landing it was about 10 miles to our next camp. 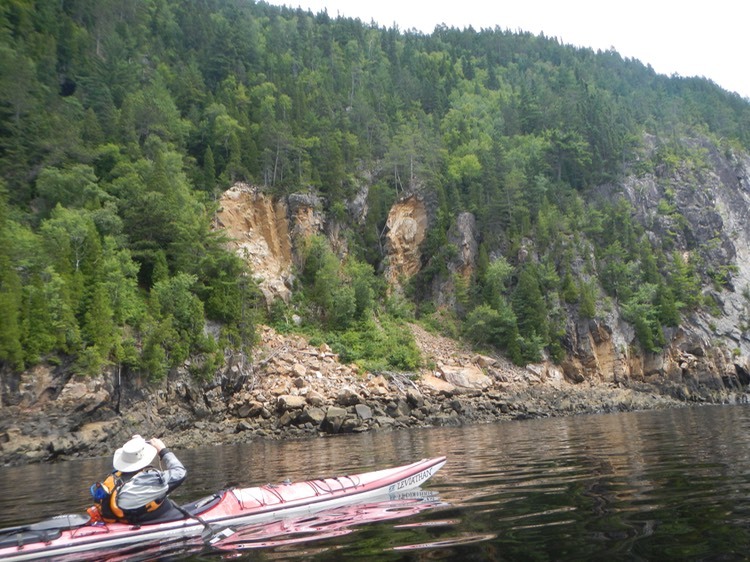 The shore line was pretty rugged with no opportunity to take a break by going ashore. As a result, some of the folks who indulged in a cup of coffee at the park store were having a rough time of it. 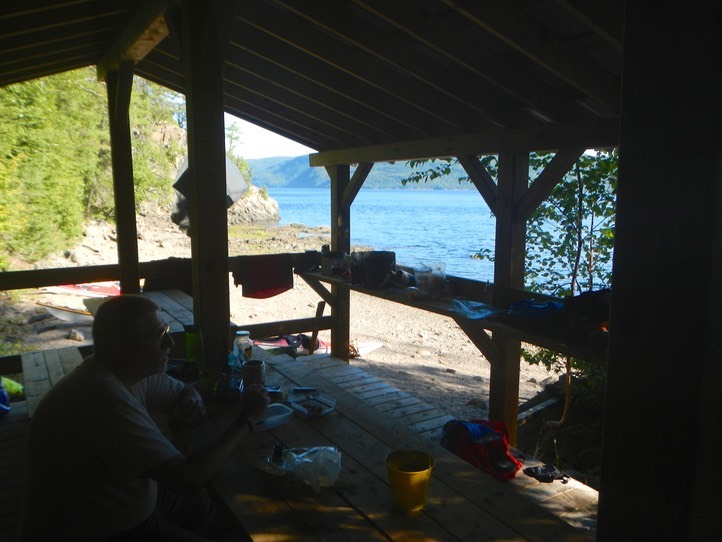 We arrived at Anse du Portage around 2 PM. This camp was arguably the most pleasant of our trip. Or maybe it was the change in the weather combined with the location that made the difference. I set up camp and laid out my paddling gear and other wet or damp gear to dry. 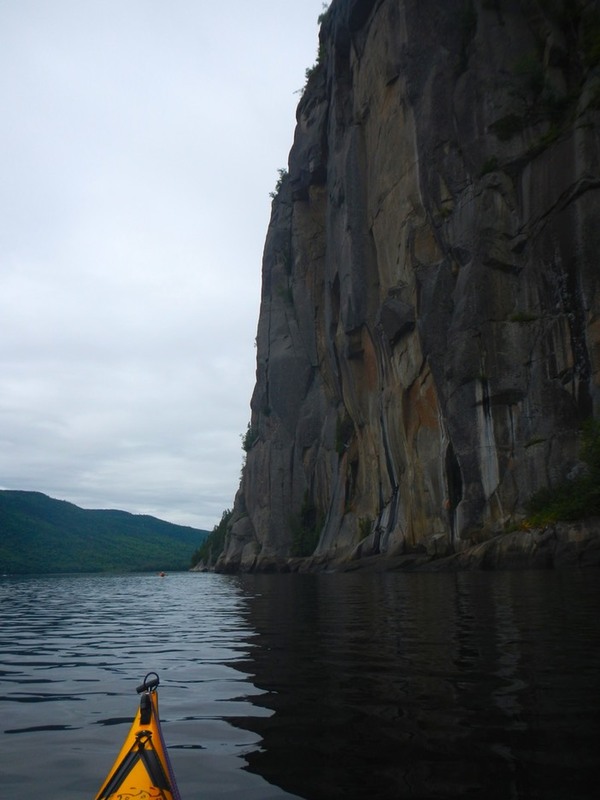 Then I sat down by my tent and just relaxed, taking in the beauty of the fjord stretched out before me. Soon it was my turn to make the meal I had brought for the group: Pad Thai with tofu, egg and bean sprouts. It was a hearty meal and well received.